The idea is to define a hackerspace as a Distributed Autonomous Organization, what it actually is, using smart contracts. Its main activities – budgeting, membership and voting will be guaranteed by the blockchain. Cryptocurrency will be used for internal expenses, project funding and sponsorship. The model will be suggested to all hackerspaces around the world and in a case of successful adoption hackerspace community could be united and a global hacker’s cryptocurrency will be used for common tasks. The idea is to define a hackerspace as a Distributed Autonomous Organization using smart contracts. Its main activities – budgeting, membership and voting will be guaranteed by the blockchain. Cryptocurrency will be used for internal expenses, project funding and sponsorship. 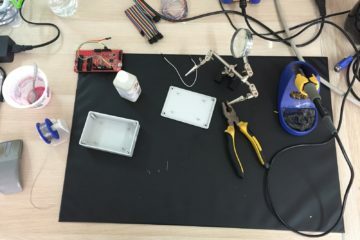 Public access to special hardware – 3d printers, IoT, etc. Membership – rules for membership, defined in a smart contract. Eliminates the need of paperwork and responsible persons. Budgeting – funding, even in cash/fiat, will be represented with tokens, which later will be used to internally define expenses. Every member donates non-fixed amount to the budget, and this mints corresponding amount of tokens into organizations contract. Voting – since the organization is ruled in a democratic manner, the ballots are important part of it. Smart contracts will be used to guarantee its validity and honesty. Voting will be used to define rules, for expenses, for projects supported by the community and other decisions.